Do you support the Naxals? - Soviet-Empire.com U.S.S.R.
Forum Index » Discussion » Votes & Polls » Do you support the Naxals? Do you support the Naxals? Do you support the Naxalite rebels in India? Why or Why not? Yes. If nothing else, the Naxals serve to destabilise the present right wing and reactionary Indian government. I wish them well and hope they don't make the same mistakes Mao made. I wonder how anybody could answer no to this. Of course I do. I dunno if they're going to have a proletarian revolution, but they're still the most progressive force in India. How could they be the most progressive force in India? They don't have a working class programme. They're peasant terrorists who emerged in opposition to industrialisation. In as far as they support the development of industrial capitalism the Congress Party is more progressive than them. Some dislike the Naxals because they kill peasants and CPI(M) members. I don't think that is a scientific reason to reject them since the CPI(M) allows peasants to die by the hands of the state which they participate in. Industrialization does not help the people and peasants of India. Especially the indigenous people of India. The CPI(M) have sold out to the capitalists, so supporting the Naxalites seems like the best choice. No industrialization is absolutely necessary to the workers of India being able to stand up for themselves. A massive peasantry is a hindrance if anything. The Naxalites murder communists not because they're corrupt or have "bought into capitalism" but because what the CPI(M) proposes would destroy the base of the Naxalites. They [Naxals] are terrorists posing as communists. That said voted Other because we're weak enough to support even people of this sort to a certain degree. If the CPI(M) don't seem to care about the people of India. They definitely did not care about the people of Nandigram. Industrialization does not help the people and peasants of India. Interesting wording, "the people and peasants." The peasants are specifically that class of people in society who have not had capitalist relations brough to them yet, so it's almost true by definition that they are not the beneficiaries of industrialisation. All the more cruel that the Naxalites should seek to deprive them of its fruits, to prevent their assimilation into capitalism. On the contrary, industrialisation has greatly improve the lives of many workers and the middle classes. Those proletarians in India able to find stable employment enjoy many of the same luxuries that we have in the west. Has it improved their lives enough? No, of course not. But even if we conceded the claim that industrialisation had been of no help, the Marxist answer to this is industrialisation under workers' ownership and control (so that they may also own the benefits), not to oppose industrialisation. 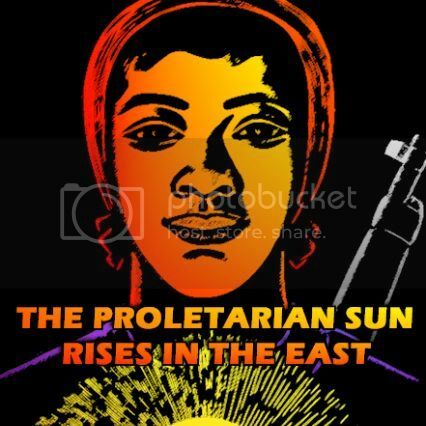 The Naxals should re-examine the revolution they claim their inspiration from and dust off their books, whatever happened to the Great Leap Forwards, comrades? Especially the indigenous people of India. The who now? When did indigenous and non-indigenous peoples of India enter this? The CPI(M) have sold out to the capitalists, so supporting the Naxalites seems like the best choice. The Jacobins supported the capitalists, so we should support King Louis? Why should we support peasant reactionaries just because they're anti-capitalist. Yes, because it's lulzy to read the stories where up to a hundred policemen die when the cops try to invade their territory. Hilarity, endless hilarity! Villages and forests of the indigenous Adivasis people are destroyed to build mine's, refineries, and factories. The Adivasis are sent to camps to live in, they are promised jobs but they never get them.